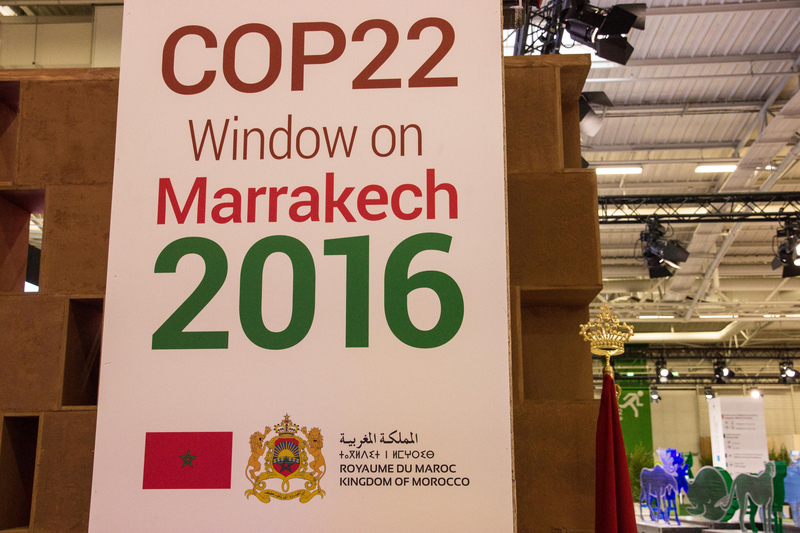 We are winding up the final day of COP22, the international gathering of 190+ nations of the world in Marrakech, Morocco, with the goal of carrying forward the Paris Agreement on climate change. This COP, or Conference of the Parties, marks the 22nd year of efforts to build international cooperation under the umbrella of the United Nations Framework Convention on Climate Change, (UNFCCC). 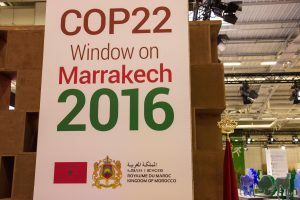 It is the first COP meeting since the historic Paris Agreement came into effect on November 4, following the approval of at least 55 countries representing at least 55% of global greenhouse gas emissions—including the U.S. Marrakech has built a conference center resembling a sprawling, modern conference center tent city. Like previous COPs, the “Blue Zone” tents hold the official negotiating sessions, dozens of country pavilions, and high-level representatives from many nations including the U.S. The Green Zone is open to all participants and includes a cacophony of languages, speeches, songs, art, and orderly demonstrations by civil society, innovative businesses, and others. The University of Minnesota’s official U.N delegation for week two of the COP includes 3 professors (myself, Gabe Chan, and Melissa Hortman) and 7 graduate students (please see other blogs here.) Our study abroad program has been supported by the Humphrey School, the Institute on the Environment, as well as the Learning Abroad Center. I arrived in the beautiful city of Marrakech with trepidation, wondering how the U.S. election and President-elect Trump’s stated intentions to walk away from the Paris Agreement would be received. The Paris Agreement was possible in large part due to the active participation of the United States, in particular the bilateral agreements President Obama forged with China and India, for the first time committing the largest emitting countries to significant CO2 reductions. These agreements and the structure of the Paris Agreement, with each country bringing its own self-determined climate action plan or Nationally Determined Contribution (NDC) to the table, created the foundation for a global agreement with virtually every nation participating. How would the world react if the U.S. were to back out of its commitments, would it threaten to unravel the global consensus? The answer I heard repeatedly in Marrakech was mostly positive but tempered with realism. At COP22 nations, civil society, business leaders and others are more determined than ever to move forward. The most commonly heard words: momentum, urgency, and action. Erik Solheim, Executive Director of the United Nations Environment Programme (UNEP) spoke to the need to keep “fundamental optimism” that we will move forward. Regarding the U.S. election he said “If US decides not to lead, then China will step up and lead the world” on tackling climate change. Outgoing Secretary of State John Kerry made an emotional pitch to COP22 attendees: “Climate change shouldn’t be a partisan issue in the first place. No one has a right to make decisions that affect billions of people based on solely ideology or without proper input….climate change is bigger than one person, bigger than one president.” Kerry asserted that an overwhelming majority of US citizens know climate change is happening and are determined to keep the Paris commitments. Matt Rodriguez, California Secretary for Environmental Protection, said the federal election is unlikely to affect the trajectory of clean energy and carbon reduction in California, because it has momentum, it is “working,” and it has partners from around the world. While the speeches have been inspiring and focused on the positive, participants are not naïve about the repercussions of the U.S. election. Around the COP numerous discussions with informed experts analyzed the different scenarios for U.S. actions on climate—all very uncertain. As the President-elect’s transition team begins its work, it shows a bifurcated approach that is characteristic of the uneasy alliance in the campaign itself. The split is between Trump’s media allies who provided an echo chamber for many of his personal and campaign statements, and the Republican Party leadership “establishment.” It is unclear which camp will be his ultimate influencers. The new administration has stated its intent to reverse the centerpiece of the U.S. climate plan, the Clean Power Plan. This could come in the form of repealing rules promulgated under the Clean Air Act, defunding the EPA’s clean air program, or an unfavorable Supreme Court decision. In the short term, research shows we are already on track to achieve significant reductions in coal power emissions, and many planned coal plant retirements will likely continue for economic reasons regardless of the rule. Others think it is likely a “first day issue.” If the new administrative wants to back out of the Paris Agreement, there are several possible pathways, all facing different legal, political, and diplomatic barriers. Perhaps the most straightforward approach is to sign an Executive Order that cancels out President Obama’s ratification of the Paris Agreement. The exit could not take effect until 2020, because it requires three years from entry into force of the Agreement, followed by a one year waiting period. Another more complex but potentially more permanent approach would be rescind US participation in the UNFCCC which was signed by President HW Bush in 1992 and ratified by the US Senate. If the US were to withdraw, it would require a Senate vote to reinstate. A third approach would be to simply ignore the Paris Agreement, by not participating in UN COP meetings or negotiations. This would be likely accompanied by defunding or reducing the authority of the key government agencies charged with leading the negotiations and implementation (State Department, Environmental Protection Agency (EPA), and Department of Energy (DOE)). Another option would be to ask the U.S. Senate to take a vote on the agreement with the intent to defeat it. However, this could be very unpopular with conservative U.S. Senators who could find it a lose-lose political proposition. If they voted against the global climate agreement, they risk criticism from many of their constituents and targeting by environmental advocates. If they vote for it, they face the threat of a primary challenge from the Tea Party or others in the Republican Party who oppose it. Trump has sent some signals that this will be an area for early action. However, there seems to be a possible middle path forward. His background and history are focused on negotiating “deals” to achieve his goals. He could give 1-year notice as a negotiating strategy, and then use his leverage to accomplish trade goals, which were a top priority in the campaign. “He seems to be an opportunist, not an ideologue. He takes positions that are expedient to take in any one political moment,” said a Sierra Club top attorney in an interview in Marrakech with E & E (Environment & Energy) news. Other Republicans have suggested he use the agreement for positive diplomatic ends, to help build stronger alliances with other countries. While the outcome is uncertain, two things seem likely: first, the Trump administration will attempt to weaken or slow efforts to reduce coal plant emissions, which may not overcome the market forces driving more renewable energy, more natural gas, and less coal generation; second, Trump will likely target climate finance obligations and reduce U.S. contributions to less developing countries. Some experts at the COP have suggested that the Paris Agreement will continue through its implementation phase over the next four years, and the remaining parties could ramp up ambition beyond what the U.S. would have accepted. Then after the next presidential election, a new administration could join again, but with more stringent carbon reduction, finance, and other obligations than the US would have otherwise faced. This could put the U.S. at a disadvantage, as its emissions may rise during the Trump administration, forcing more costly mitigation later. But it could have the additional salutary effect of strengthening the Paris Agreement so it is more likely to meet the ambitious targets limiting warming to 1.5 or 2 degrees. In the final days of the COP, the draft Marrakech Action Proclamation is taking shape with negotiators. This was intended to be the “COP of Action” but may end up as more of a statement of intent to continue taking action. A recent draft welcomes the rapid entry into force of the Paris Agreement, reiterates the urgency to act on a warming climate, and recognizes the extraordinary momentum this year has seen. The draft recognizes specific needs and special circumstances of least developed countries and those particularly vulnerable to climate change, and calls for the “highest political commitment’ to combat climate change, reduce greenhouse gas emissions, and improve adaptation; additionally it pushes for urgently raising ambition, strengthening cooperation, and increasing the flow of finance. A final theme of the Morocco draft is a positive call for action and implementation, which will bring opportunities for prosperity. In a nod to the election, it specifically calls on all non-state actors, like U.S. states and cities, to “join us.” As we return to the U.S., at the top of my mind will be two final points: that the U.S risks losing its global influence by standing on the sidelines, and that progress on climate action will be up to states, cities, businesses, universities, and local communities in this power vacuum. As I return home, I will focus on how we can help enable those local, state, and regional efforts to fill that leadership gap.